Capezio’s Duro-Toe pointe shoe model has a very interesting history. Capezio made this particular model to solve an economic need during the depression years in the United States. In 1929 the stock market crashed leaving American families in dire financial straits. Many depression era families struggled to stretch a dollar and find ways to survive by making products that had lasting qualities. As a pointe shoe manufacturer, Capezio saw the need to design a strong, sturdy pointe shoe for dancers whose funds were limited because of the economy. Not only was Salvatore Capezio an ingenious business man, he showed his humanitarian nature by creating the Duro-Toe. The Duro-Toe was quite popular back then. Little by little as the economy improved and the years went by, the Duro-Toe fell out of favor with dancers. The biggest complaint was how noisy they were on stage. Dancers were showing a marked preference for lighter, more flexible pointe shoes. 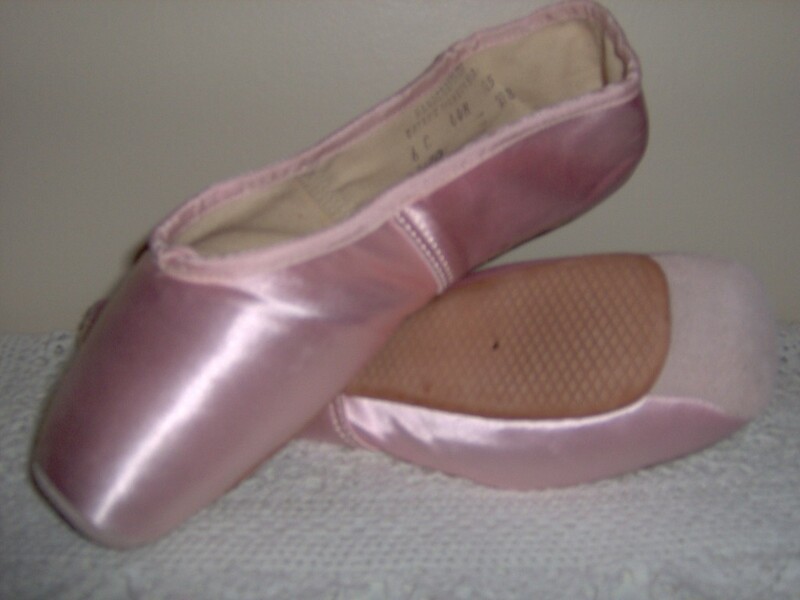 The Capezio Company stopped production of the Duro-Toe model in 1998. Within the last few years, the stock of available Duro-Toes on the market has dwindled down sharply. I consider myself very fortunate to own a pair. This particular model is what is know as a “love it or hate it” type pointe shoe. Most dancers who have tried the Duro-Toe model feel strongly either way. I happen to find them beautiful! I was expecting a very clunky, unflattering pointe shoe and was pleasantly surprised. The suede toe cover matches very well with the color of the satin. These are my personal photos of the pair I own. This entry was posted in Discontinued Pointe Shoes and tagged Capezio Duro-Toe, discontinued pointe shoes, Pointe Shoe Brands, Pointe Shoe Images. Bookmark the permalink. Duro Toes were also popular with girls who wanted to tap en pointe with the special taps that disappeared from the market around 1991. There is yet no mass made replacement for the once common pointe shoe taps; although this writer and a friend on Long Island, NY have given it a try on a limited basis. If I can recover sufficiently from my amputations, I’d like to get back in the shop and give it a go again. Pointe shoes aren’t just for classical ballet; and with taps across the whole platform, they aren’t quiet at all! Barry – any chance you are making toe taps or know where i could find someone who does?